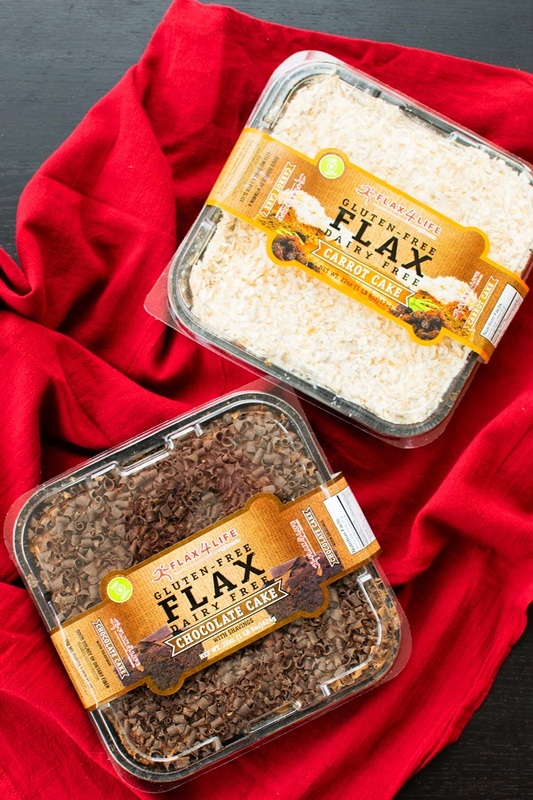 A couple of years ago I discovered Flax4Life cakes at a natural foods tradeshow, and kept a diligent eye on their website to see when they would be available. They did hit shelves for a brief time, but then disappeared. Luckily, they are back, in stores, and are now in more convenient packaging. They changed the taller round cakes to square shapes that stack and fit safely in the refrigerator. Flax4Life cakes are frosted, bakery-fresh cakes that are reportedly made in a dairy-free, gluten-free, and nut-free facility. They keep on the counter for several days, but are refrigerated once opened, and can be frozen to enjoy at a later date. These cakes are also relatively high in Omega 3s (from flaxseed), and contain a little dose of fiber and protein in each serving. I’m the odd person out who prefers frosting to cake. I’ve never been a big fan of fluffy sweet bread, with one exception: carrot cake. 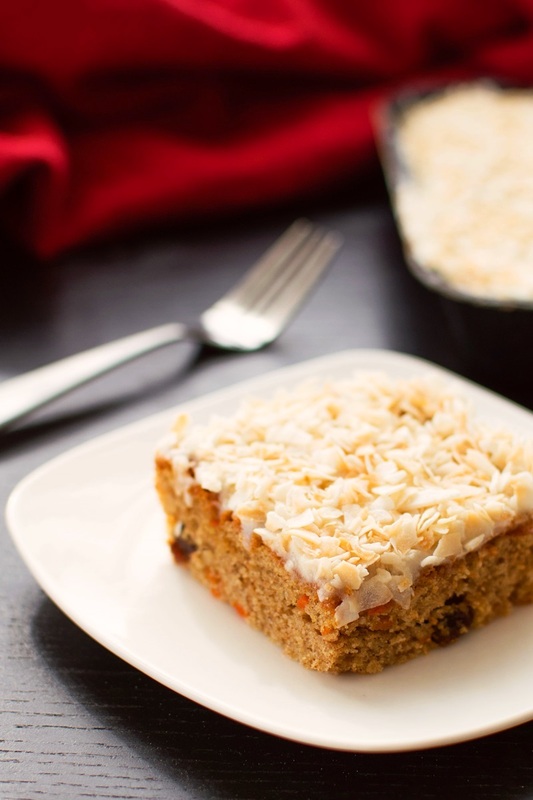 Not the cake-mix type, but rather rich, moist, dense, flavor-loaded carrot cake. So I was eager to see if Flax4Life cakes could be my new holy grail for last minute special occasion needs. The Carrot Cake has a pleasant sweetness, and it’s relatively low in sugar when compared to other frosted cakes. 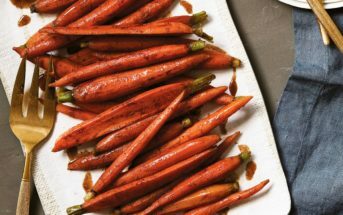 It has a nice carrot-rich flavor, with ample spice and just a smattering of big plump raisins. It was a little drier than most carrot cakes, with a slight gluten-free “tell.” But the moist coconut-y frosting helped to offset these factors. And we found that covering and heating a slice for just 10 to 15 seconds in the microwave helped to perfect the consistency without melting the topping. Both Tony and I really enjoyed each slice with afternoon tea and I think it would be a marvelous Easter or spring cake for gatherings. Ingredients – frozen egg whites, evaporated cane sugar, tapioca starch, ground flax seed, carrots, toasted coconut, powdered sugar (sugar, corn starch), water, raisins, expeller pressed safflower oil, dairy free cream cheese (filtered water, coconut oil, tapioca starch, coconut cream, non-gmo expeller pressed safflower oil, vegan natural flavors, pea protein isolate, sea salt, cane sugar, xanthan gum, potato protein isolate, lactic acid (vegan), vegan en-zyme, lemon juice concentrate, guar gum, locust bean gum), natural vanilla extract, aluminum-free baking powder, soy lecithin (non-gmo), ground cinnamon, xanthan gum, sea salt, ground nutmeg. As mentioned, I’m not a big cake person, and chocolate isn’t an exception. But wow was this good! The cake itself was a touch more moist than the carrot cake, and it had a very nice, perfectly sweet and deep chocolate flavor. But it was that fudgy frosting and decadent layer of thick chocolate curls that put this cake over the top. Tony loved this cake, and quickly inhaled a very large, rich piece. I couldn’t resist it either, and even picked it as my favorite of the two flavors. I won’t say that this cake has the exact texture of a wheat-based chocolate cake (albeit close), but we really didn’t care. Ingredients – frozen egg whites, evaporated cane sugar, cocoa powder, tapioca starch, ground flax seed, belgian dark chocolate (cocoa beans, sugar, cocoa butter, soy lecithin), powdered sugar (sugar, cornstarch), expeller pressed safflower oil, water, natural vanilla extract, aluminum-free baking powder, organic soy milk (water, whole organic soybeans), coconut oil, soy lecithin, xanthan gum, sea salt. Availability: You can order Flax4Life Cakes online. They ship direct from bakery to customers throughout the U.S. They are also sold in natural food stores throughout the U.S. I found them at my local Sprouts on the shelves in the bakery section. 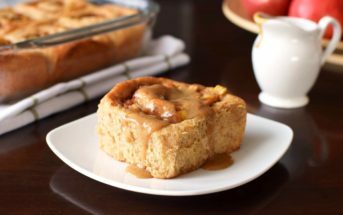 Certifications: Flax4Life Cakes are Certified Gluten-Free. Dietary Notes: By ingredients, Flax4Life Cakes are dairy-free / non-dairy, gluten-free, nut-free, peanut-free, and vegetarian. Nonetheless, check with the company on their manufacturing processes for all varieties if potential allergen cross-contamination is an issue for you. Processes and labeling are subject to change at any time for any company / product. For More Product Information: Visit the Flax4Life website at flax4life.net. I’m surprised they’re not egg free, since flax eggs are the best. So close, but still can’t give it to my son. It looks amazing though! The chocolate ribbons are a nice touch to this product! Looks like a great choice for dairy free people! I tried these a few weeks ago at a Safeway event and LOVED LOVED it. Their carrot cake is amazing. Actually, love all of their products and their brownies are also amazing. Oh yes, those brownies are marvelous, too! Glad the cakes went over well with you Andrea. I tried the carrot cake and did not like it, and so then I was afraid the chocolate cake would be the same. I may try it now that I see you preferred it. My favorite Flax 4 Life item will always be the chocolate brownie muffins. Amazingly yummy, even family members that can eat all the gluten they want love them! If you’re a fan of their brownie muffins, then I definitely think you should give the chocolate cake a go. It is quite different from the carrot cake. I recently tried Flax4Life products at a trade show and was soooo impressed by how wonderful they taste. Wow, so amazing!! I’m glad you like them too. Glad they are nut-free for your family, too, Sharon! Whoa! Those look so moist! What a great easy option for guests with allergies! I just checked the website, and Flax4Life isn’t available in Miami. 🙁 I’ll keep my eye out for them expanding into Florida. The cakes sound good. You know, their store locator isn’t updated very well. I’ve spotted them at stores that aren’t listed in my area. They also ship direct – their muffins are amazing, too! So glad you were able to find the product again. I love when that happens. 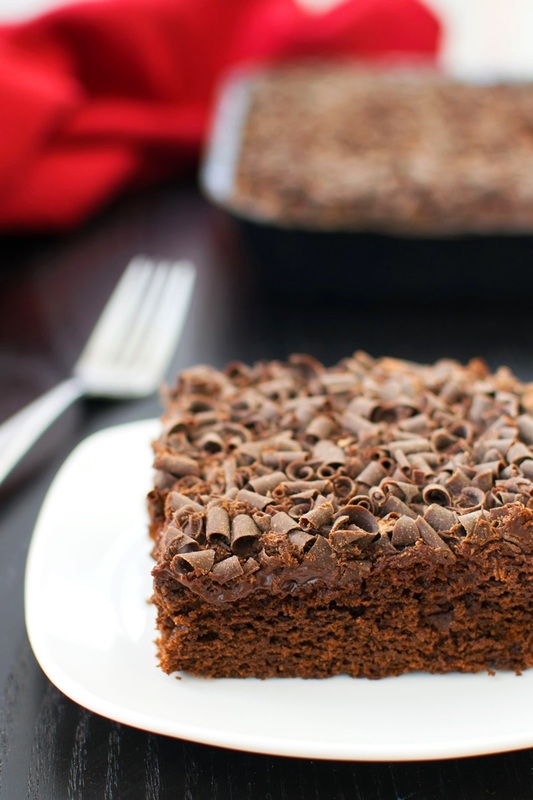 The chocolate cake looks delicious! Both of these sound delicious to me. I’ll have to see if they are available locally. I’d love to have this available for a quick dessert. I’m going to have to share this with a few friends of mine who are DF & GF. They’ll love this.